Happy Monday! I know it's a little random, but I had two completely unrelated blogworthy events this weekend. On Saturday afternoon I finally saw Black Swan. My opinion? Love. Some people said Black Swan was disgusting, I thought it was unique and edgy and artistic. Everyone warned me about how disturbing this movie was, so I was mentally prepared for the worst, which made the actuality not so bad. I think that people expect ballet movies to all be silly and pretty like Center Stage, but Black Swan is more of a psychological thriller set in a ballet. Natalie Portman was amazing, and there are scenes I can’t get out of my mind (the final black swan dance where she grows wings was breathtaking and the Swan Lake music is so dramatic!). I have experience with a few African staples: Nigerien tuo made out of millet (ick), Congolese sorghum (yum), and of course Ethiopian injera (yummm!). 6x6 went with Plantain Fufu with Spinach and Egusi “soup.” The fufu came in a slightly sticky ball – imagine a ball of really starchy mashed potato (but with a banana-ish plantain flavor). And the spinach and egusi wasn’t soup-y at all. Egusi is ground pumpkin seeds, so the dish was julienned spinach in a salty pumpkin-y sauce. Then there was a side of absolutely fabulous rich tomato sauce. I got Banku with Chicken Curry. The chicken is cooked in that same tomato sauce, and was soooo flavorful and rich and delicious! 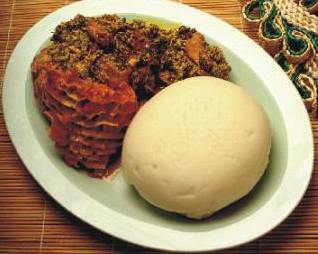 I liked my banku more than the fufu – it also came in a ball - imagine a starchier and more flavorful polenta. Delish! Our Ghanian friend got the Wakye (rice and beans) with Beef Stew – he said it was pretty good and very authentic. “Shito” is the condiment they give you on the side. It’s a mixture of dried ground shrimp and chilies. It’s spicy and salty and very classic Ghanaian. 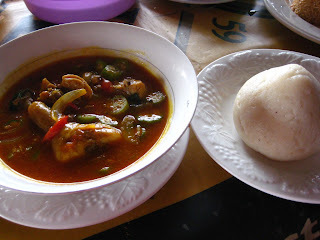 Overall the meal was a total win – we’ll definitely return to the Ghana Café. And next time I'll take pictures, because these ones I found do not do it justice! (And get excited…there are plans for an actual Ghana trip in the works!). The Weekend Report: Happy MLK Day!